I think it’s fair to say that if most golfers don’t like playing from the sand, they dread playing bunker shots from compacted, wet sand! Bunkers with wet sand are common here in the UK. But we’re not the only country to get rain and except for the very best golf courses, green staff won’t have the time to constantly keep golf bunkers in a perfectly raked condition. Wet, compact or semi-frozen sand or bunkers that don’t have a lot of sand in them, very often lead to those destructive, thinned bunker shots. There are certain adjustments we can make to both our set up and club selection to get a good contact out of wet sand and give ourselves a chance of getting up and down. Normally, we’d always opt for a sand wedge out of a bunker because the additional bounce prevents the club from digging into the sand. From wet, compacted sand however, a lob wedge (normally about 60 degrees of loft) is more suitable. 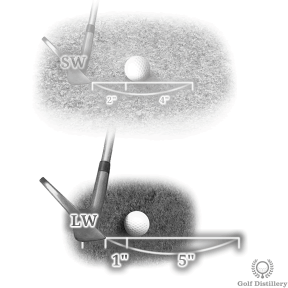 This will allow the club to cut through the sand where a sand wedge is more likely to bounce off the top. Whereas normally we’d take 2 inches of sand behind the ball, aim to strike the sand only 1 inch behind the ball. More than that and the club will slow down too quickly causing a very heavy shot that stays in the bunker. Set up as normal – nice wide stance, feet firmly planted, ball slightly ahead of centre in the stance, gripping down for control, feet aiming left of target to compensate for the open club face aiming well right. Aim to skim the sand instead of taking a deeper divot. Trust that the sharper leading edge of the lob wedge will cut through the sand rather than bouncing off it.